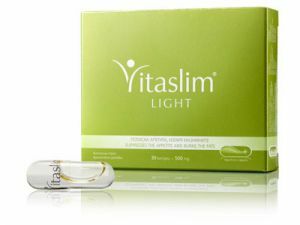 According to a research conducted by “Pharma Brand”, Vitaslim LIGHT is “The most recommended weight loss product by pharmacists”. It ensures twice easier and faster weight loss with no drastic changes in lifestyle. The exceptional effectiveness of the product is due to its light formula – it contains only two ingredients - PinnoThin™ and CLA. Combined together, they reduce food intake by suppressing appetite and increase calories burned – the two most important factors for a successful weight loss. The completely natural ingredients are effective and have fast action due to their special liquid form (patented Licaps® technology by Capsugel). Less Food without Hunger: Due to PinnoThin™ Vitaslim LIGHT suppresses appetite and effectively helps you avoid overeating. It creates a feeling of satiety and balances feeding. It makes you feel full with a lot less food. The result – less calories taken – no feeling of hunger. Fat Burning: Apart from suppressing appetite, Vitaslim LIGHT also burns fats. The active ingredient CLA improves metabolism, speeds up burning of subcutaneous fat, and transforms fats into muscles, thus shaping a firm and good looking body. Vitaslim LIGHT burns fats when you rest (even during sleep). Contraindications: There are no known contraindications. Pregnant and nursing women should consult a physician before taking Vitaslim LIGHT. This product is not recommended for people allergic to fish products (fish gelatin capsules).